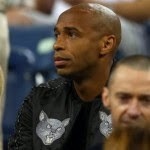 Arsenal legend Thierry Henry insists Chelsea cannot be blamed for last month’s Paris Metro incident. A group of supporters were filmed refusing to allow a black man on to a train following the Blues clash with Paris Saint-German last week. But speaking on the Jonathan Ross show, Henry said: “You can’t have a go at Chelsea because it is difficult to control who is going to travel. “I’ve played games away from home in Europe, in countries that are not very clever. A lack of education can be the thing. “You play a game and you try to concentrate and keep your composure and what you hear sometimes is ‘black this’ and ‘*****’ and ***** chants, and people spitting at you when you take a corner kick. “It is not easy, it is not easy. That has to stop and what has to be done for it to stop? I don’t know. You need to have a zero tolerance, I believe in that.